Gary Moore’s life was far too short, but his sonic artistry will live on forever. This fact drove the creation of Moore Blues For Gary, a new all-star tribute album conceived and coordinated by Moore’s long-serving bandmate and dear friend Bob Daisley (Rainbow/Uriah Heep/Ozzy Osbourne/Black Sabbath/Mother’s Army/Widowmaker/Kahvas Jute/The Hoochie Coochie Men/Chicken Shack, etcetera). Bolstered by a stellar production and an absolutely bulletproof track listing, the 13-song release celebrates Moore’s decades-long musical adventure (including, among other things, beautiful and downright tear-inducing nods to the man’s remarkable creative relationship with the late Phil Lynott) while showcasing the obvious influence he had on some of the greatest guitarists in Rock history – many of whom make appearances on the album itself. 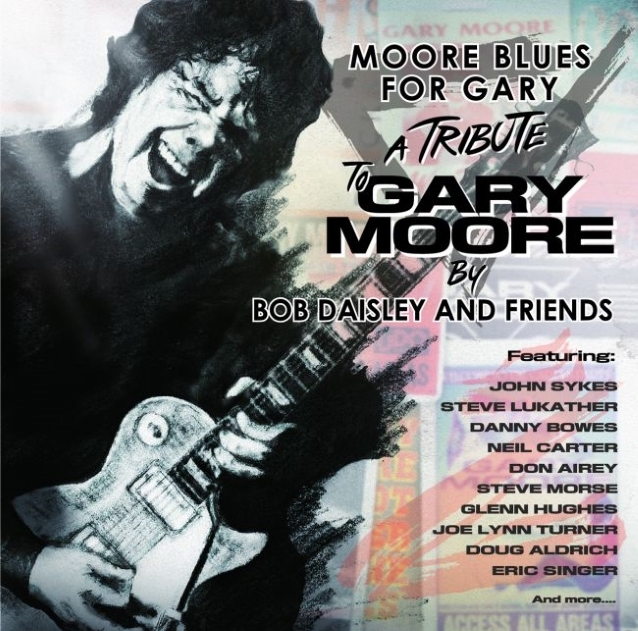 Those names – and the names of so many others who’ve contributed to Moore Blues For Gary - will not be listed here in this intro, as it is worth reading the interview with Bob below just to see these extraordinary players come up in conversation. Simply put, the level of musicianship displayed on this album is as jaw-dropping and exciting as the man who inspired it. I think the first time you mentioned this project to me was around two years ago. I started this album at the beginning of 2015, and it was completed earlier this year. So, it took three years to do. Having said that, within that time, there were people who sort of messed us around and said, ‘Yep, I’ll do a track as long as you can wait.’ Then, we’d wait and they didn’t do it. We even had somebody who actually did a take and sent it to us. We edited it and started mixing and preparing the track, then they said, ‘Oh, the record company won’t let us release it,’ so I had to find someone else for that track. There are 13 tracks, and they have got different singers, keyboard players, drummers and guitarists. It was my project, so I’m the only common denominator in all of it. One thing I find very interesting about this album is that it’s as much a history lesson on you as it is one on Gary. You have people like Jon Butler from Widowmaker, Tim Gaze from Kahvas Jute and Stab Webb from Chicken Shack on there. These are guys who go back with you a long, long time. Yeah, that’s right, and there’s even some very early Gary Moore history with Brush Shiels. He was in Skid Row, Gary’s first band in Ireland. There’s some family history here! Absolutely. Stan, Tim and Jon are people who had a major part in your history. What was it like to work with these guys again, and what do you think they each brought to the project that made it even more special? With Tim Gaze, I suppose it was the familiarity. I’ve known Tim since the ’60s. As of late, we did that stuff with Jon Lord and The Hoochie Coochie Men and the live show at The Basement here in Sydney, which was on DVD. After that, we did a studio album called Danger: White Men Dancing, which was received very well. I think that came out in about 2007. A year or two later, I was talking to Jon Lord about doing another one. He loved Tim’s playing, and he loved working with me. Rob Grosser, the drummer from that project, is involved in the Gary Moore album as well. We all worked so well together. We had planned to do another studio album, and then Jon died. The first couple of basic tracks I sent off to people for Moore Blues For Gary were of Rob, Tim and myself. It was nice to have that little foundation to get the ball rolling. I’ve kept in touch with Stan for the last 40-odd years. He’s a classic Blues player. When I joined Chicken Shack in early ’72 in London, Stan was a bit of an authority on Blues and the history of the Blues players. He was very knowledgeable with all that stuff, and he taught me a lot. When I joined Chicken Shack, I was soaking up that information like a sponge. I’d go to his house, and he’d pull out old 78s of Blues artists and play me stuff. He’d say, ‘This is where Jeff Beck got this from,’ or, ‘This is where Jimmy Page got this from.’ It was really fascinating for me. I always liked Jon Butler’s voice. He was the second singer in Widowmaker after Steve Eliis was booted out for various reasons. Butler had that sort of warmth and feeling in his voice that I could relate to. I always rated him as a singer. I’ve kept in touch with Jon over the years, but we hadn’t done anything together for a long time. In the early ’80s, we talked about putting something together with Neil Carter when Neil and I were working with Gary Moore. Jon was in the circuit with Gary in the earlier days. He used to share dressing rooms and talk to Gary and all that, so there was a connection there. I think Jon’s done a great job of singing on those two tracks [‘Story Of The Blues,’ ‘That’s Why I Play The Blues’]. It was nice to have the opportunity to work with people I hadn’t worked with for such a long time. I originally had the track that Stan played on [‘Torn Inside’] in mind for Peter Green, but Peter had issues and problems and all that. It would have been nice to have him – and Stan – on the album. When Gary did that track and I played on it with him, it was a real tribute to early Fleetwood Mac and Peter Green; it had that vibe about it. I thought Peter would be good for it, but he was one of the guys who sort of said, ‘Yes, I’ll do a track, No, I won’t. Yes, I will. What track do you want me to do? Okay, well maybe if you wait around...’ He ended up not doing a track at all. It was disappointing, because Gary had done a whole album of Peter Green’s material and called it Blues For Greeny. I thought if anybody would do a track as a tribute and a thank you to Gary, it would have been Peter Green. But it didn’t happen, so there you go. Stan did a good job on it. I’m happy with the track, and it turned out really well. Your daughter Rose also makes an appearance on the album. Yeah! She’s got a nice voice and a very good ear for music. She’s been interested in music since her birth. She used to bop in front of my jukebox with her little nappy on when she was about 18 months. When Rob Grosser and I were going through all the stuff, we decided that ‘Empty Rooms’ and ‘Story Of The Blues’ needed a female voice. I thought, ‘Rose has got a good voice,’ so we got her in the studio. It worked out really well, and she was over the moon to be on the record with all these great people. We’ve got to talk about Joe Lynn Turner, who is on fire on this record. He did a great job on ‘The Blues Just Got Sadder,’ and that needs a good singer. I thought, ‘Who’s got a really good voice?’ I phoned Joe, and he said, ‘Yeah!’ ‘The Blues Just Got Sadder’ is a song I wrote with Dennis Wilson, who I’ve known since my Kahvas Jute days. 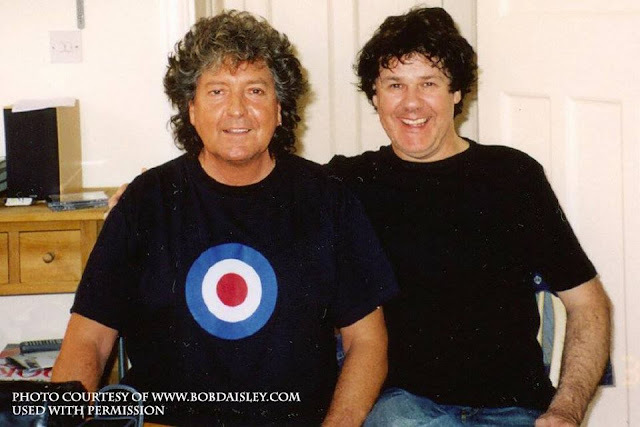 Dennis and I wrote a few songs a few years ago, and I always thought, ‘This would be a good song for Gary Moore to do.’ I never got to play it for him before he passed away. Because of the title, ‘The Blues Just Got Sadder,’ it’s my personal tribute to Gary by saying, ‘The Blues is sadder now that you’ve gone.’ I’ve got Steve Lukather on that track; what a great player he is! There's a blinding amount of stuff that he’s done over the years. He’s Ringo’s guitarist at the moment, and he’s in Toto. He’s worked with all these other people, including all those huge albums with Michael Jackson and people like that. He was great; Steve Lukather is a lovely guy. He said, ‘I’m honored to play on this.’ That says a lot for Gary and me to get that sort of respect. Joe also did ‘Power Of The Blues,’ and that’s with Jeff Watson on guitar. It’s almost like Mother’s Army pays tribute to Gary Moore, but with the drummer from the Gary Moore band, Darrin Mooney. It all sort of fell into place. ‘Parisienne Walkways,’ with Ricky Warwick, was another song we did on the album. It’s not really a Blues track, strictly speaking, but it’s a real trademark track for Gary. I thought, ‘That’s going to go there.’ When Steve Morse agreed to do it, I thought, ‘Wow! Perfect.’ Steve was another well-respected musician and guitarist who said he was honored to do it. I’m looking at the track listing, and all of these songs are heavyweights. There’s not a weak one in the bunch here, but which songs did you enjoy recording the most? I enjoyed them all for many reasons. One of the songs is the one that Glenn Hughes sang, ‘Nothing’s The Same [Without You].’ The first time I ever heard that when Gary recorded it, I thought, ‘What a great song!’ It was a really good song, and I felt very touched by it. At the time, my mom had recently died; it just rang that bell, you know? When I decided to do this tribute album for Gary, I thought, ‘That song is a must.’ It turned out really, really well. It’s a good version. When I began to do the material, I thought, ‘Well, I don’t want to re-create what Gary’s done. I don’t want to compete with Gary in any way and say, ‘This version’s better than yours or just as good as yours.’ It’s just my take on it. Another song is ‘That’s Why I Play The Blues.’ I remember being in the studio with Gary in London at the end of 2003. I flew over there to do the Power Of The Blues album. All the tracks were done virtually live. It was just the band playing live in the studio and being recorded. The version of the song that we were doing in the studio at the time had keyboards and brass on it. Gary ended up not using the brass on that track, but I still have a recording of the version with the brass on it. It just sounds so authentic. But I remember just standing there playing with Gary and Darrin Mooney on drums and the keyboard player, the brass and all that. I thought, ‘I’m enjoying this so much! It just doesn’t get any better than this!’ I was savoring every second of it, and that really stuck in my mind. ‘The Loner’ is another one. We used to have fun playing that one on stage. It used to go on for like 20 minutes sometimes. The intro alone that Gary did was three or four minutes long sometimes, and there was an outro that could go on for another 10, 12 minutes – even longer. It wasn’t boring or self-indulgent. You could see that the audience loved it. That song had to go on there as well. It’s not really a Blues song as such, but it’s another great Gary Moore song that’s not out of context with all the Blues stuff. Doug Aldrich did such a lovely job of playing on that. There’s another song on there that I co-wrote with Dennis Wilson called ‘This One’s For You.’ I thought it was a good song as another tribute to Gary, but with his sons on it. His son Gus sang it, and his other son Jack played guitar on it. Even though I wrote it with Dennis, I think it’s a nice little hats off to Gary with his sons there. I’m happy with every track. I personally think some of these people’s finest performances ever are on this album. Yeah! I mean, John Sykes…He was another one. I’d say he was influenced by Gary Moore. He sounded a bit like Gary at times, and John has always been a great guitarist. I don’t know if he went into hiding or didn’t want to do much, but he wasn’t really high profile for a while. So, when he agreed to do a track, I was really pleased. He did one of Gary’s real signature tunes, ‘Still Got The Blues For You.’ It’s just lovely what he did on the outro part. Eric Singer certainly plays into your history as well. Well, sure! He’s in my history with Black Sabbath; we did the album The Eternal Idol together. Then, it was my suggestion to Gary to get Eric in the band when we needed a drummer. We auditioned so many drummers, and I said, ‘You know, I’ve worked with Eric Singer. He’s great.’ They flew him over, and he ended up getting the gig. Eric’s with me in Gary’s band on the Live In Stockholm 1987 video. It’s a shame that hasn’t been re-released on DVD; it only ever came out on VHS at the time. I had to have Eric on there because he had been part of the Gary Moore band. I’ve got Don Airey on the album as well. His history with Gary goes way back. How far back do those two songs you wrote with Dennis go? There’s a Blues legend in America called Guitar Shorty. Jimi Hendrix used to go watch him when he was very young, and I think Guitar Shorty actually married Jimi Hendrix’s sister or something. His organization contacted me and said, ‘Shorty’s doing a new album. Would you be interested in writing a few tunes for him?’ So, I got together with Dennis; this is probably around 2005. We knocked off a few tunes, and two of them were ‘The Blues Just Got Sadder’ and ‘This One’s For You.’ He ended up not recording them; I think it had to do with the record company or the publishing company – yet again, probably something to do with money, control, percentages and all that stuff. But I always liked those songs. And everybody I played the demos to loved them. Oh, sure! The thing about Gary was that he wasn’t just a virtuoso. Over the years, there have been lots of virtuosos. They’re fast, and they can play complicated stuff with speed or whatever. But with Gary, it all came from the heart. He had so much emotion in his playing. He could play something slow or just a few notes, and it was very emotive. Do you have any new musical endeavors planned for the not-too-distant future? I do, actually. I’m working on some stuff with Rob Grosser. He and I have been knocking out some instrumental stuff. It’s almost bordering on being Surf music, but with a subtle, more modern and, in parts, almost a spacey Pink Floyd vibe. Some of it is in a category similar to ‘Albatross’ by Fleetwood Mac. I’m really pleased with it. It’s nice; it’s good listening stuff. You listen to some of the stuff and you think, ‘This would be great for a TV theme!’ or, ‘This would be good for a movie or advertisement.’ It’s got its own character and its own mood. Rob and I are going into the studio at the end of this month to mix some of the tracks. I find it enjoyable to do it; we’ve had fun doing it. I think when you have fun doing something and you really enjoy it, it comes out in the music.